Rather than getting glasses or contacts to address these vision issues, patients can instead undergo laser eye surgery. One of the latest advances in LASIK technology involves wavefront scanning. This means that traditional LASIK has now been replaced by custom LASIK, which offers many advantages. Among these advantages is the ability to improve a patient's night vision if a problem exists prior to undergoing LASIK surgery. What makes custom LASIK different from traditional LASIK? The wavefront digital mapping technology used in custom LASIK surgery involves a state-of-the-art three-dimensional scan of the cornea. This information is fed into a computer, which allows your LASIK surgeon to identify lower order aberrations as well as minute corneal imperfections, which are known as higher order aberrations. Lower order aberrations are the refractive errors that we have listed above. Higher order aberrations are minute visual imperfections that are very hard to detect, among which is a problem with night vision. You see, the cornea affects the way that light passes through the eyes en route to the retina, which is the light-sensitive tissue in the back of the eyes. Major issues with corneal contour (lower order aberrations) result in refractive errors, while the minute corneal contour issues (higher order aberrations) have different effects on the way the retina interprets the incoming light. Traditional LASIK surgery was only able to correct lower order aberrations with regular frequency. With custom LASIK, both lower order aberrations and higher order aberrations can be treated successfully. Many patients notice problems with night vision as they heal from LASIK surgery. That means both traditional LASIK and custom LASIK. This is a natural part of the healing process, actually, and to be expected. 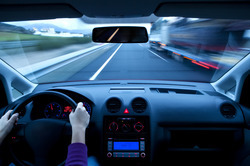 Patients are advised to be wary when driving at night for the first few weeks after surgery because of this very issue. The difference, however, is that patients often experience better night vision following custom LASIK, particularly if the patient had problems with night vision prior to the procedure. This is all thanks to the sophisticated wavefront mapping technology. With custom LASIK, the refractive surgery patient of today sees much better than the refractive surgery patient of the past. In addition to correcting both higher order aberrations and lower order aberrations, custom LASIK is actually safer as well. The three-dimensional digital map that is fed into the computer is used to guide the surgical laser itself. This eliminates potential human error and ensures the most accurate level of corneal correction available today. If you would like to learn more about custom LASIK surgery and how it can be of great benefit to you, be sure to contact our Bakersfield laser eye surgery centers today. The entire team here looks forward to meeting you in person and helping you achieve excellent vision and great eye health.